Posted on November 25, 2016 June 9, 2018 by NGCHS, INC. Eager eyes were cast increasingly upon Payson, AZ. and the Rim Country from the Phoenix metropolitan area as desert dwellers longed for an easier road over the Mazatzal Mountains. The Northern Gila Country Chamber of Commerce was equally eager to receive tourists from the Valley. With pressure from both sides of the mountain, a new day was about to dawn for Payson. It might be said the town was about to “come of age in the modern world” and lose its isolation. 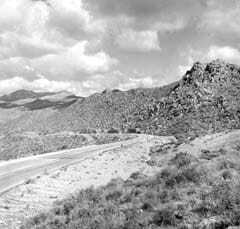 It was in the early 1950’s that a Maricopa County supervisor named Jim Hart joined forces with the regional chamber of commerce to forge a more modern road over the mountain than the slow and dangerous Bush Highway. Supervisor Hart had a summer home in Payson, to which he often retreated, and he interceded with the Salt River Pima and Fort McDowell Indian tribes to obtain a diagonal right-of-way across their reservations from McDowell and Country Club in Mesa to the intersection with the Bush Highway at the Saguaro Lake turnoff. This shortcut gave the name “Beeline Highway” to the project. From there the old route was to be upgraded, curves straightened, bridges installed, and the leg around Mount Ord was moved west along Slate Creek to eliminate the rough trail down through old Camp Reno. 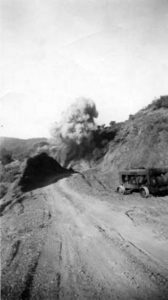 The workers, among them some Payson residents, attacked the route with vigor, dynamiting their way through the canyons and hillsides. The crew lived at the cinnabar mining camp along Slate Creek, called Goswick Camp. One of the workers was Mel Counseller, who had never operated a jack hammer before. By the second half of the 1950s the Beeline Highway was still a gravel road, but traffic was increasing. It was evident the road needed to be paved before the roadbed was completely destroyed. 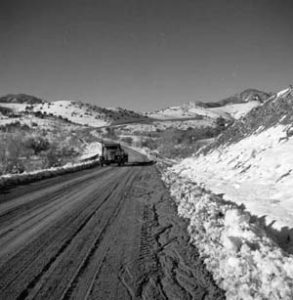 That pavement was laid, forming the first paved road over the mountain into Payson, and the ribbon for the two-lane highway was cut when it reached Payson July 19, 1958. The quiet, backwater town was on the threshold of a population and land boom. To celebrate, the people of Payson hosted a free barbecue, the one they had to postpone back in 1933 when the Bush Highway did not make it when planned. Valley newspapers heralded Supervisor Jim Hart as the “Father of the Beeline,” and a movement was launched to honor him by naming the highway “the Hartline.” However, on February 6, 1960, Jim Hart was killed on his way home from Payson in a single car accident near the intersection of Shea Boulevard. Paysonites, grateful for his contribution, were moved to memorialize him with the purchase of a piece of equipment for the Lewis Pyle Memorial Hospital, where Hart had served on the board. The money raised was not quite enough for the equipment planned, so the fund was directed instead to a monument on the highway near the place where Hart lost his life. Likewise the growing population of the Rim Country was grateful for quicker transportation to the Valley of the Sun. When life began running out for the surface of the two-lane road, and auto and truck accidents mounted, the Arizona Department of Transportation planned to make this historic route a four-lane, divided highway. Gradually, segment by segment, this was engineered and built. In the late 1970s and early 1980s sections from Payson south to the junction of State Route 188 were built. Then between 1995 and 2001 the $170 million highway from McDowell Road in Mesa north to State Route 188 was under construction. The modern highway, with its engineering feats, received many awards, and in November 2003 the State Board for Highway Designation gave the route over the Mazatzals a new name: The Beeline Scenic Parkway. It seemed that a saga of Arizona history had ended, and a new one was about to begin. 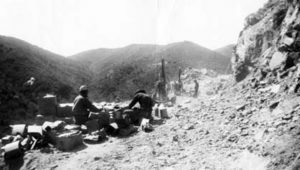 From 19th century settlers pressing for military protection, to the economic ambitions of 20th century merchants and local politicians, roads across the Mazatzal Mountains were deemed a necessity. From the military departments during the Apache War to the supervisors and Forest Service superintendents of Maricopa and Gila counties, it took influential persons in high places to get the job done. The completion of the major highway across the Mazatzals had a social, economic and political impact on both the Salt River Valley and Payson, AZ. The road eventually spawned a number of commuters who could now travel to their business headquarters in the Valley several times a week while working on their personal computers at home the rest of the time. 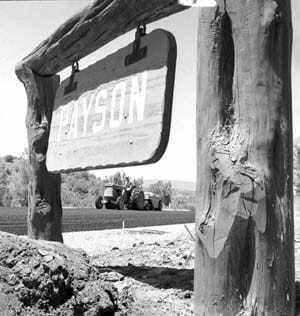 From the early days of the first Bush Highway local leaders stated that tourism would be the key to Payson’s future economy. 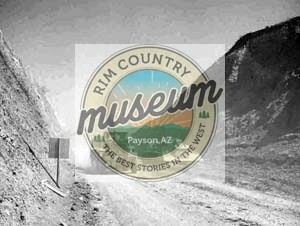 The scenic highway became the gateway for visitors to Payson, the Rim Country and beyond, with its prime recreational opportunities for hunting, fishing, camping and escaping the desert heat. From a small mining and ranching center in the waning days of Apache occupation, the frontier town of Payson had taken on the heart throb of a modern American town. Between 1980 and 1996 traffic on the narrow two-lane highway quadrupled, and injuries and deaths increased 25 percent each year according to ADOT. in those years, 152 people died on the Beeline Highway; not one year was free of fatalities.